Tun Dr Siti Hasmah : A Class Act! We all love Tun Dr Siti Hasmah. Tun Mahathir is OK, but Tun Hasmah is special! Mahathir is a Doctor, so is she! For a start, she sings better than Tun! Not only does she sings, but she can also play the piano, the violin and for sports, she plays badminton. Bukan posing dengan racket aja…but Siti Hasmah actually plays badminton! Tun Mahthir cannot play the piano or the violin, and as for sports, all that I have seen Tun Mahathir do is kick a ball. Yes he can kick a ball very very well. Full stop. Itu aja…tendang bola memang ada class. Tapi lepas tu boleh ka Tun dribble? Boleh ka Tun lari dengan bola? Tendang corner? Tackle opponents? Has Tun ever scored a Goal? Pernah ka Tun main first half or the second half? Has Tun ever play in any half in any football game? Has Tun Mahathir any other football skill other that kick the ball? I think not. Modal Tun Mahathir hanya pandai tendang bola aja! 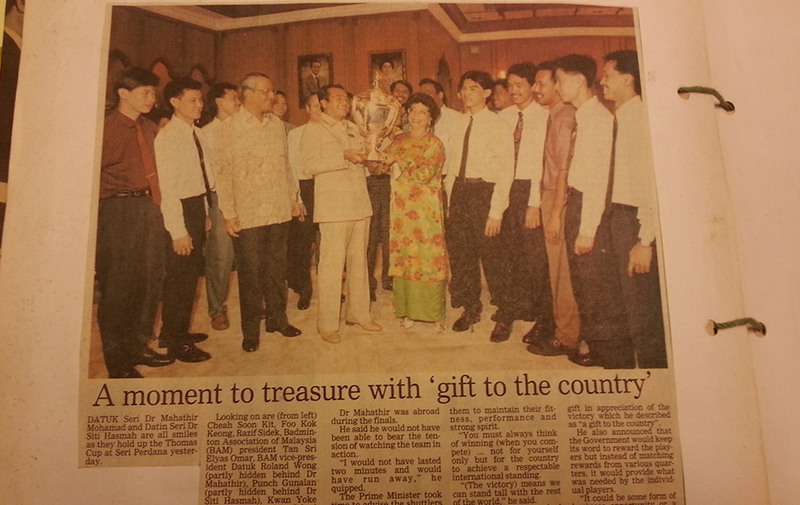 Wheras Siti Hasmah was playing competitive badminton until the age of 75 and she helped the Malaysian Badminton team win the Thomas Cup in 1992. And dah lepas menang, bila ambik gambar, Tun Mahathir tompang masuk limelight…tak malu!!! How long did Tun Mahathir took to write his book “A Doctor in the House: The Memoirs of Tun Dr Mahathir Mohamad”…lapan tahun. Siti Hasmah wrote her book in six months!!! In all the hurly burly of politics at the highest elitist level, she is calm, serene and is as graceful as a swan gliding across a placid lake. Not for her the pomp and ceremony that is beloved by the other former occupant of Seri Perdana. She is always in the background but she has a presence that is felt by all around her. If Mahthir sits down by the roadside, she is there beside him. Of course Rosmah would want to do that with najib too…but if Rosmah does sit down with Najib by the roadside….how is she going to get up? So cannot lah! The Police wants to talk to her…Tun Siti Hasmah obliges. She goes beyond being the dutiful wife and is a good companion for Tun in everything that he does. She is there to support him in all his endeavours, be there for him to tell him when to rest and and take care of Tun as good as any doctor can…and it helps that she is one too. On behalf of many many Malaysians, from the bottom of our hearts with all our passion, we all want to thank Tun Siti Hasmah for being there for Tun Mahathir at all the most trying periods of his life – especially during GE14. And for being there for Malaysia and for all Malaysians in the time of our greatest needs. Tabek Tun Hasmah you are indeed a gem…and that husband of yours is also OK lah!